In 1902 Ernest Warther started making knives of his own design and technique because he wasn't satisfied with the quality of the knives he could buy. 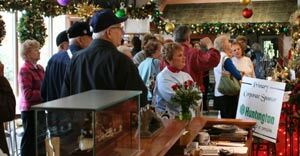 Visit the Warther Carving Museum, in Dover, and you’ll experience the amazing story Ernest "Mooney" Warther and how his combined love of family and their hobbies were used to create an amazing legacy that still lives today. 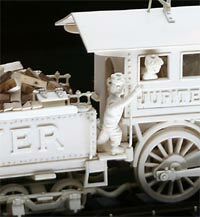 Ernest Warther turned his carving into creations the Smithsonian called “priceless works of art”. In an age when steam locomotives were king, so many of Mooney's carvings were based on the mighty steam locomotives of the day. Many are made of walnut, ebony, and ivory. His carvings combined not only history and artistry, but also with motion by giving his locomotive carvings the ability to run authentically. Exacting precision and detail reflect Mooney’s amazing skills and passion for steam technology. In fact, the perfection and mechanizing of his steam locomotives earned him the title of World’s Master Carver, in the 1920’s. Ernest Warther first made knives because he couldn’t find a knife that would hold an edge when carving hard woods like walnut. Then his mother complained about her kitchen knives not staying sharp, so Ernes made his mother a paring knife. Word spread about the wonderful kitchen knives that Warther was making and soon he had a thriving business. When the local steel mill he was working in shutdown, Mooney turned to knife making to support his family. 2nd, 3rd, and 4th generation Warther’s still use the same techniques Mooney developed to create Warther handcrafted kitchen knives. 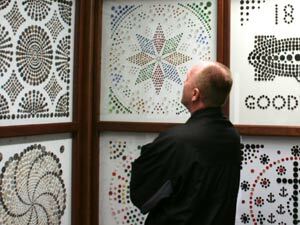 Freia Warther spent her life collecting buttons and amassed over 100,000 buttons while creating a unique display of 73,282 buttons that are displayed on the walls and ceilings of her little "button house" on the museum grounds. Freida began her button collecting at the age of 10 and collected for the next 83 years. She collected about every type of button including: hand-painted ceramic buttons, Goodyear rubber buttons, pearl buttons, brass military buttons, celluloid buttons, calico buttons and even a button from Mrs. Lincoln's Inaugural Dress. After her children were grown, Freida started laying her buttons out in her own unique designs and quilt patterns. Once the buttons were laid out, she sewed all them onto boards by hand. The New York Central Railroad heard about Mooney's carvings and in 1923 made him an offer to exhibit his models on a special train. Mooney quit his job after 23 years at the local steel mill and toured the country displaying his carvings for 6 months. 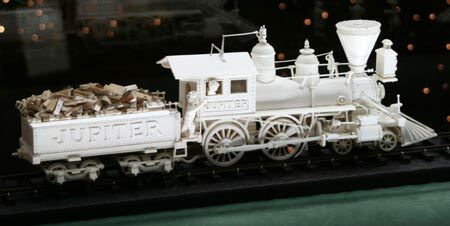 After that, he displayed them in Grand Central Station in New York City for another 2 1/2 years. The Lincoln Funeral Train was Ernest's last large project and was completed in 1965 on the 100th anniversary of Lincoln's assassination. The train took a year to complete working 14 hours a day, 7 days a week and it is over 8' long. This project was of special significance to Ernest in that he never new his father and had adopted Abraham Lincoln as his idol. During his time working with the railroad, he talked about his carving and made souvenir pliers for the showgoers (replicas of these pliers are available in the gift shop). At the close of the show the railroad offered him $50.000 for his carvings and $5000 a year to remain with the display at the station, but he declined their offer. He also received an even more handsome offer from Henry Ford but turned that down too. He replied, "My roof doesn't leak, I'm not hungry and my wife has all her buttons." The Warther property has several buildings and gardens. 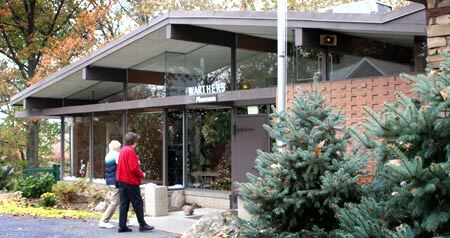 The main building holds the Warther Museum and carving display, the factory, and the gift shop. Below the buildings is a small park with a small switcher engine, signal shack and B&O caboose. Open 7 Days a Week 9 a.m.- 5 p.m.
Last tour starts at 4 p.m.
Open 7 Days a Week 10 a.m. - 4 p.m.
Last tour starts at 3 p.m.
Monday-Saturday 10 a.m.- 4 p.m.
Ernest "Mooney" Warther was born in Dover, Ohio on October 30, 1885 to Swiss immigrants. His father died when Mooney was only 3 years old, and his mother struggled to keep the family together by taking in washing, ironing, mending and boarders. Because of the pressing economic circumstances, Ernest was only able to attend school through the second grade. It took him 4 years to get through 2 grades because he would only go to school when the weather was too bad to take the cows to pasture. Calling on his Swiss heritage, he went to work as a herdsman. At the time, everyone had a "family cow" or two for milk. Those who lived in town had to arrange for a pasture, and this was the basis for Ernest's business. For a penny a day, he would take cattle from Dover to pasture in outlying areas, returning them at nightfall. At the age of 28, Mooney Warther built this little workshop. It was at this point that he says he "Stopped whittling and started carving." The original 8' x 10' shop is now incorporated into a larger building. Whatever material Ernest choose for his carvings, the one constant is the detailed workmanship he exhibited. All of his carvings were from scratch. When viewing his carvings, you'll notice that his attention to detail grew even keener with age.